For Fred Van Dyke surfing is not just a sport but a special way of life that knows no age, gender or generation barriers - where on the waves everyone is equal. 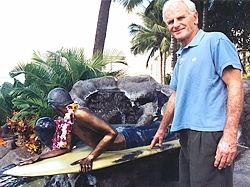 He credits surfing and teaching young people (30 years at Punahou) for keeping him forever young, vibrant and enthusiastic. "Fred Van Dyke inspires young people as well seniors that anyone can accomplish their goals in life." Makua Lives on the Beach. 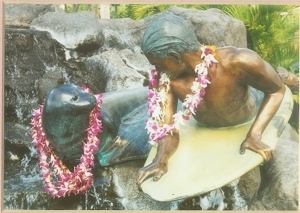 Makua is a handsome, strong boy, an honor student who lives at Sunset Beach. He has a touch of sensitivity you cannot miss. 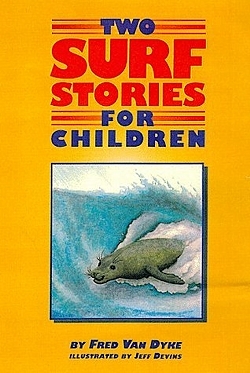 Makua has a hard time convincing his friends & family about his unique friendship with a Hawaiian monk seal who has become his surfing buddy. Trouble arises & special life lessons are learned. The Old Man Who Loved Surfing. 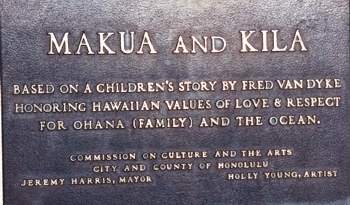 Pop loses his wife, the love of his life, and finds Makaha, the local people and the children, his new-found family. He spends as much time as he can on the beach there and surfing. Pop wanted to catch a big wave, a really huge wave, a 25-foot Makaha giant. The way of life in surfing is a special life. All ages can plan together. The usual barriers between father, son, mother, daughter, teacher, student, disappear as you catch a wave. You are one on the wave, equal, only judged by how well you ride. Click here to order this book with two great stories.